This is another post devoted to the work of JW (Bill) Figg, skating through some of his regular themes and obsessions. Figg liked particular streets (the King’s Road as you’ve already seen, but other less obvious ones like Dovehouse and Sydney Streets), particular buildings and particular details in streets and alleys. We’ll look at some examples of all these in today’s post, starting with a bit of a scoop, at least as far as I was concerned. 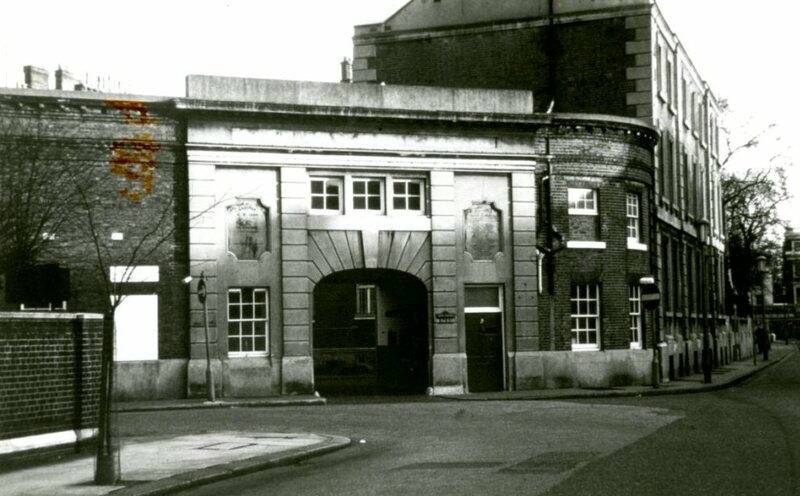 The Chelsea Workhouse in Dovehouse Street was an institution I’d read about and seen as a detail in pictures of a larger area but the first time I saw a picture of the entrance was among Figg’s pictures. 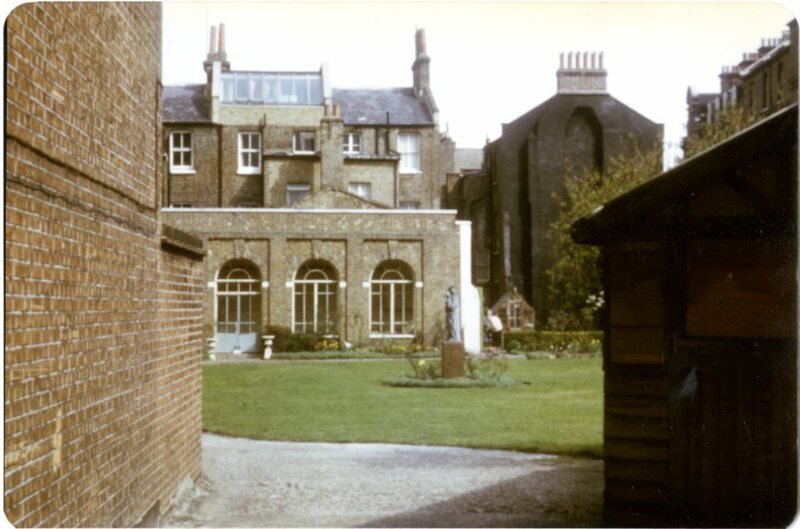 This is the side of the building, with the old Chelsea Hospital for Women visible in the distance, now part of the Royal Brompton Hospital complex of buildings. The original workshop was laid out in the 1730s and expanded several times in the 19th century. In the 1920s it became the Chelsea Institution, a presumably less punitive place to stay. 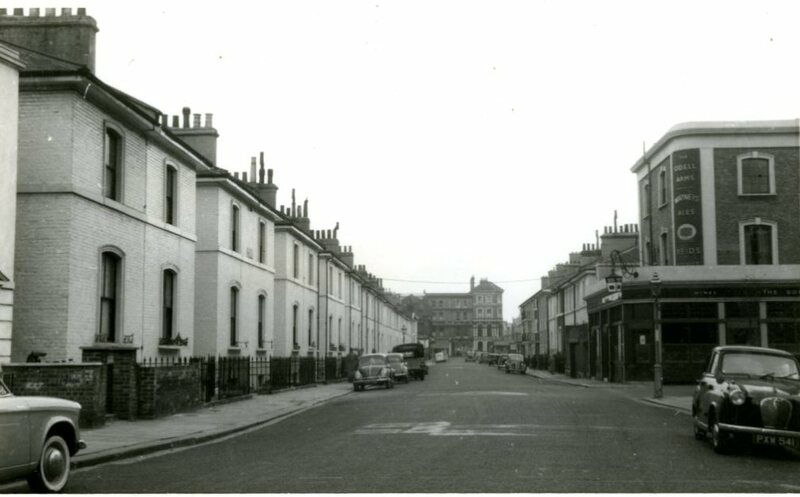 The building was demolished in the 1970s and replaced by an old people’s home called Kingsmead which has itself been demolished in the last year. Moving along Britten Street to Sydney Street you come to a small row of houses which have survived all the building upheavals around them. Figg took more than one picture of this block. In this colour image (1980s?) you can see the highly decorated Britten Street part of the corner building. The next picture is also in the vicinity. 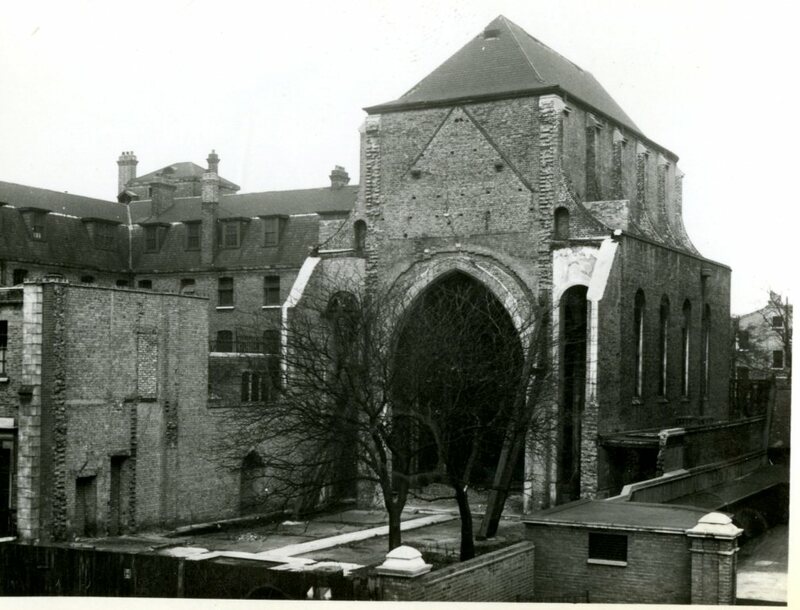 A view into the garden of the St Wilfred’s Convent building. This became part of the hospital complex in 1968. 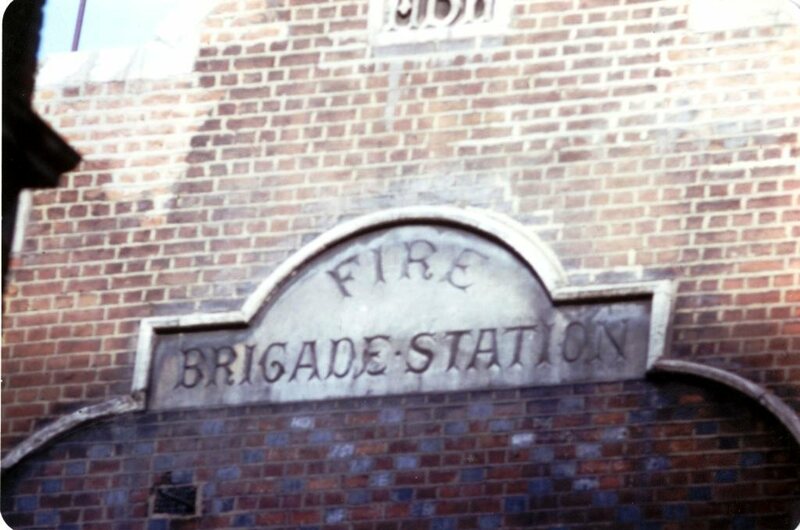 Figg was a lover of the small details that can be found on the walls of buildings, like this sign on the old fire station. Or openings and holes in, around and under buildings, like this one in Manresa Road. We’re moving in a southwards direction into Old Church Street. As you can see from the cow’s head at the top of the façade this was the site of an urban dairy (see this post). 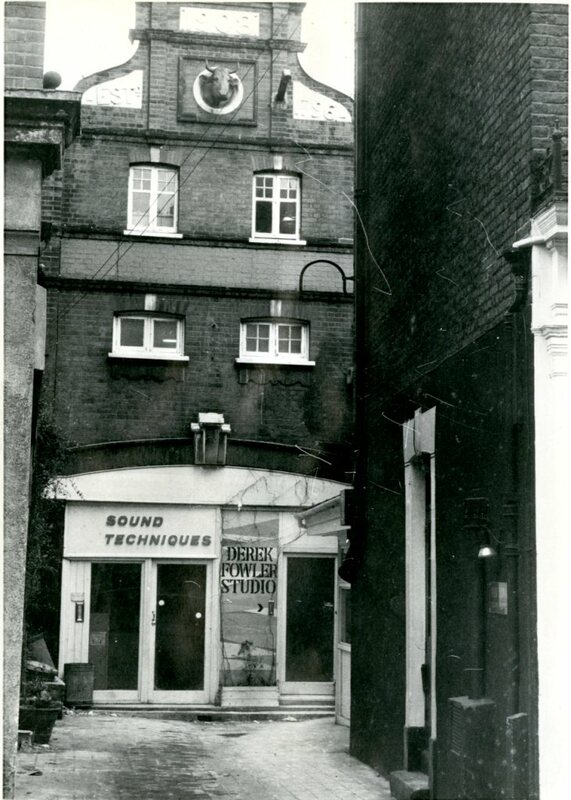 You can also see that it was the home of a recording studio, Sound Techniques. Behind this unassuming frontage albums were recorded by John Cale, Nick Drake, Fairport Convention, Incredible String Band, Jethro Tull, John Martyn, Pentangle, Pink Floyd, Richard Thompson, Sandy Denny, Steeleye Span and many famous names from the late 1960s / early 1970s. You can find out more here. Those names set me thinking of the Chelsea Pageant pictures including one in this post . But that’s probably just a personal flight of fancy. 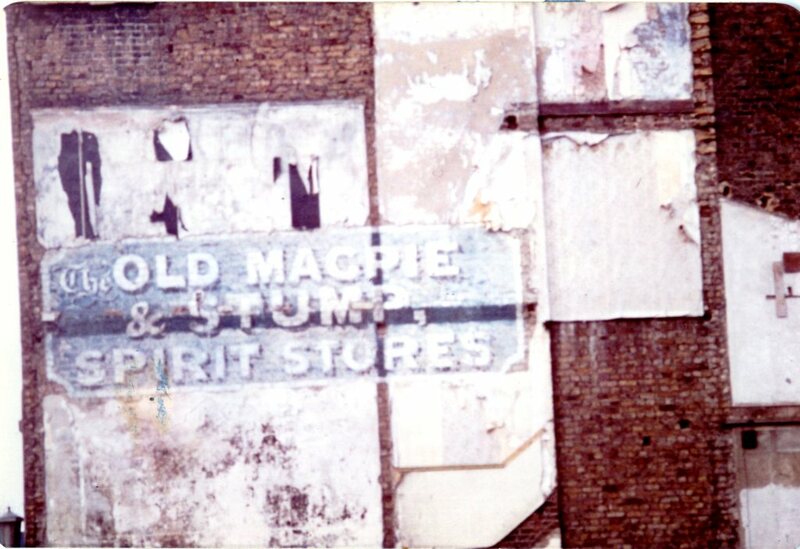 Not too far away was an example of what are now called ghost signs, remnants of old businesses who have left faded signs on walls. From one wall you can’t see any more to another. 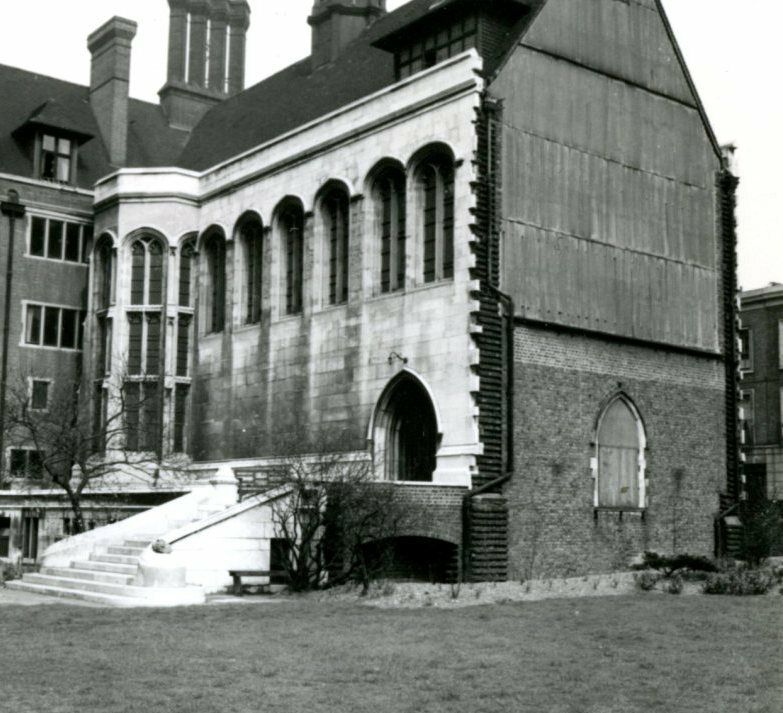 This is Crosby Hall, the City of London building transplanted to Chelsea in the 1920s, before it was bought in the 1980s and converted into a private residence with a couple of wings of pastiche Tudor palace added cutting off this view. Literally, round the corner in Beaufort Street was the Convent of Adoration Repatrice, damaged by bombs in 1940. The building was replaced by a chapel in 1985. It now forms part of a Catholic educational establishment, Allen Hall, which is the building on the left. 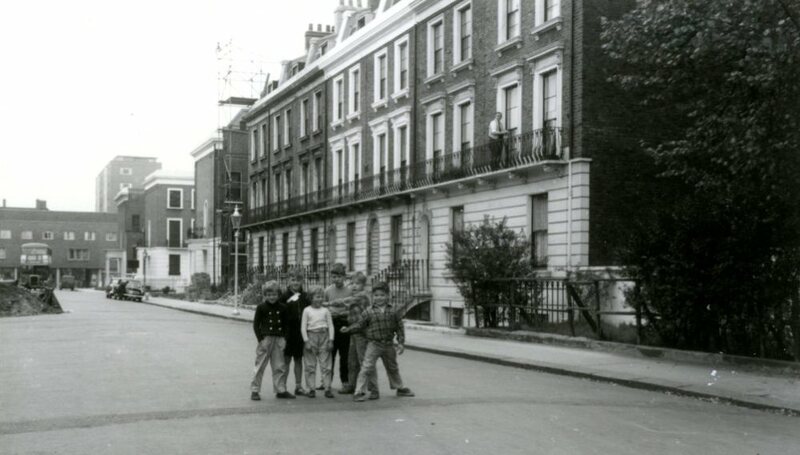 We’re crossing the King’s Road again now, into another much changed street, Park Walk. Many of Figg’s pictures are unlabelled so I have a few named Unknown Street, which I may put before you in a set one of these days. 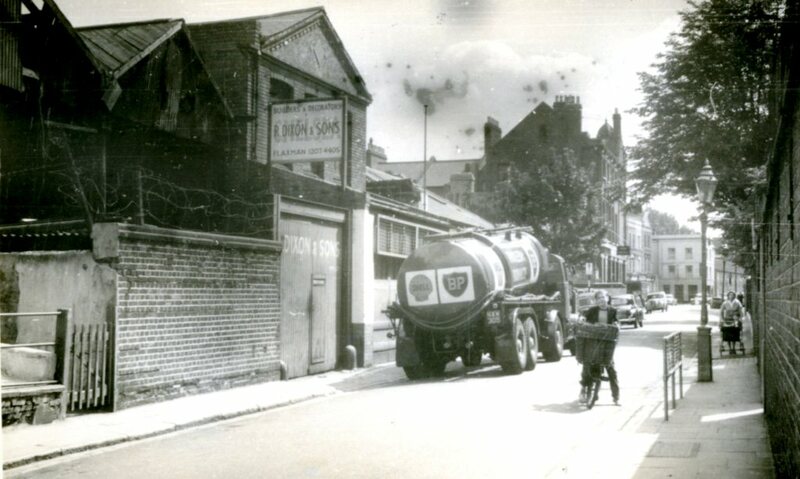 I’ve identified this one (1950s I think) as Park Walk because of the wall and pavement on the right, recognizable as Park Walk School, and the Globe pub visible in the distance. (see one of my first Figg posts). The left side of the street up to the back of the former Man in the Moon pub also visible has been completely redeveloped. We’ve been a little short of people this week so here is literally a bunch of them in nearby Hobury Street. Finally, another Figg obsession: bomb camage. 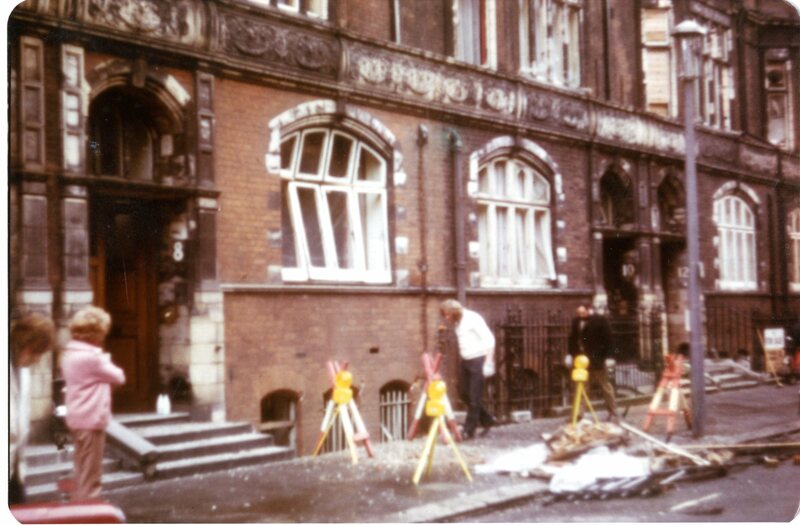 This shows Cadogan Gardens after an IRA bomb. I’m not sure of the date to be honest. My wife remembers seeing bomb damage in Chelsea on her way to school on one occasion at least but neither of us could pin this down to a particular year. Perhaps someone could help with that? I’m a bit late posting this week. Too much of my proper work to do, and a bit of an upheaval in the archive rooms. But Figg is worth waiting for, I think. I’ll do a few more of these random selections in the coming months, and definitely think about showing you some as yet unidentified locations. This entry was posted on Thursday, March 8th, 2018 at 5:26 pm	and tagged with Chelsea Old Church, Chelsea Workhouse, Crosby Hall, Figg, Hobury Street, Limerston Street, Park Walk, Sydney Street and posted in 20th Century, Chelsea. You can follow any responses to this entry through the RSS 2.0 feed. 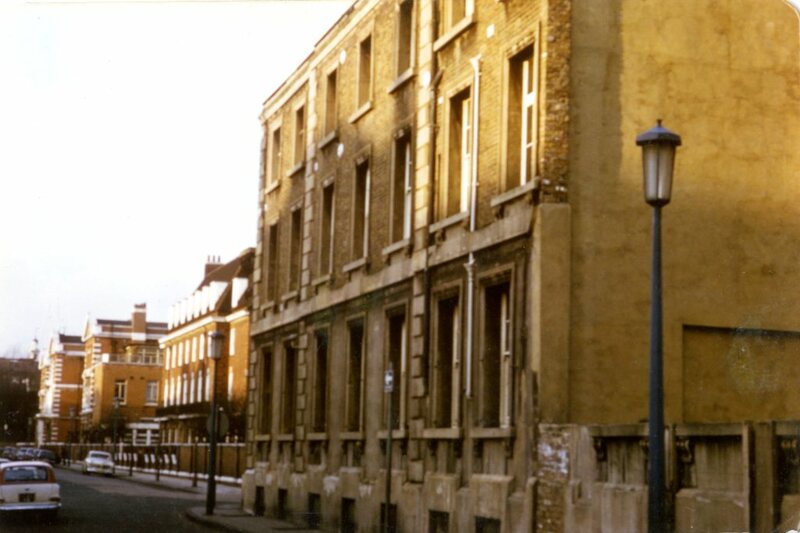 The letter box on the (SE) corner of Tite St and Royal Hospital Road was bombed in ~1974; I don’t know anything about the Cadogan Gardens incident. 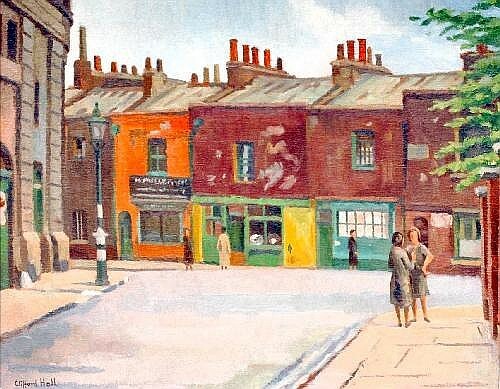 Chelsea-based artist Clifford Hall captured the entrance to the workhouse in this painting entitled, as far as I can tell “Britten Street Chelsea looking at Arthur Street (now Dovehouse Street)”. There is also a YouTube video (without audio unfortunately) about the incident, posted by the AP Archive, which gives the date as 6 January 1974. By the way, you need to scroll back to the very beginning of the clip. The second half is blank. Amazing photos. Thanks Dave. I don’t know why we can’t find anything about the Chelsea bombings though. 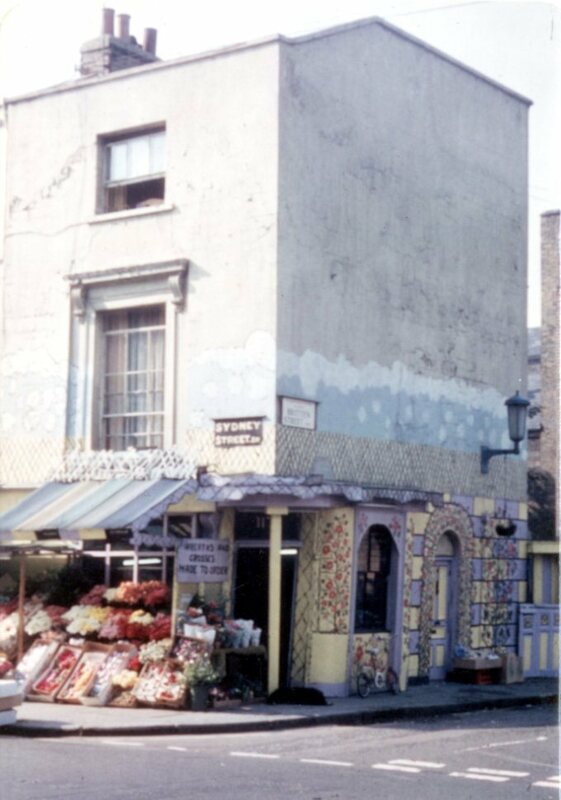 I had a friend whose Dad was killed at a restaurant right off Sloane Sq in 1974 — can’t find anything. 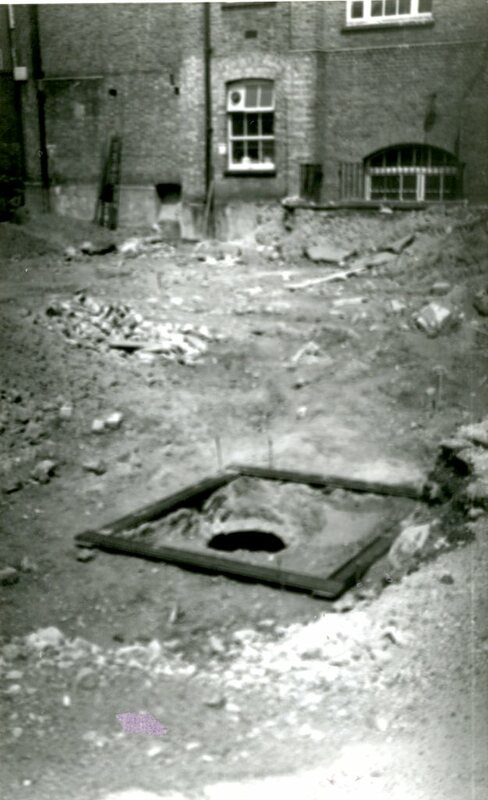 Perhaps it’s not the London way — my old school (131-133 Queen’s Gate) had a bomb dropped right outside — I don’t know if this was part of the 185 Queen’s Gate bomb in 1944 or part of the drop that damaged the Natural History Museum in 1940. Anyway, windows were all blown out — emergency service personnel were living in the lower levels of the house and they all survived — this was years after the school had been evacuated to Downe House in Berks (QGS — including the headmistress who described herself as an “unrepentant Londoner” — was grateful of course but there were the usual city vs country differences) and they only just publicized this bomb site recently. Mustn’t grumble.